When Söndag i Sängen was released in 1993, the name of the group, Bo Kaspers Orkester, and the yellow-tinted cover indicated some irony. And there may have been some, but probably it was mainly a tribute to the jazz stars that had inspired the group. Much of the album goes in a lounge tempo, with lazy melodies and laid-back singing, invariably with a lot of humor. And while the lyrics of Bo Kaspers Orkester will probably never change anyone's life, being all very harmless and cozy, they give proof of skilled craftsmanship. And lyrics don't have to be life changing, but the lack of nerve can give an irritating feeling of that the music is not "for real." At times they manage to get closer though, like in "Jorden Snurrar," sounding as if Jan Johansson sat at the piano. And in the few funky numbers the detachment provides a funny contrast. Listen to "Hennes Syster Sa." 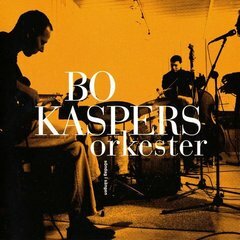 This is the album by Bo Kaspers Orkester where the jazz influence is the most visible, and therefore their most unique, for there really were no other groups sounding like this in 1993. But jazz is only an influence and something they use to make their music, which is pop, though sounding as if most of the last 40 years of musical innovation, especially rock & roll, had not happened.